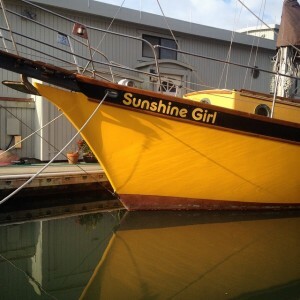 In the next slip over from where I live, the Sunshine Girl is docked. When I sleep, my head lies no more than ten feet from her starboard side, and when I wake, her yolk-yellow hull is all my legally blind eyes can see. Often, when I think I am moving, it is really the Sunshine Girl that is. In the year I have lived here, I have come to know the yellow boat’s owners. Two brothers bought it together, one named Matt, and one with a name I have forgotten. It is a common name, like Bill, which is what I will call him. I saw Matt more often than Bill. He always apologized for forgetting my name, telling me that his memory was poor because his health was not good. Matt was about my parents’ age, which is sixtysomething, but he walked with a cane, moving slowly, and sometimes laboring for breath. I met Bill one Saturday, as I was dragging a blue wheelbarrow full of climbing gear to my car, headed for Yosemite to go climbing. Bill told me that he was a climber, too–in fact, he had recently bailed off Central Pillar of Frenzy. What a coincidence, I told him! So had I. That weekend, I went back and climbed it with Alex, though I didn’t send, and took a healthy whipper on my red Alien. One sunny afternoon, Matt came down to the Sunshine Girl with some friends. They sat on the deck of the boat drinking and talking and laughing. I left my door open and listened to snatches of stories–travels and adventures, friendships and romances, narrow escapes and big mistakes, jokes and calamities.They could have been any group of friends, telling their tales. In a predictable rhythm, the storytelling periodically reached its punchline, and the friends erupted in laughter. I couldn’t eavesdrop closely enough to hear any whole story, but I knew the stories anyway. Or rather, I knew my own versions of those stories. Not my stories, but our stories. Listening to the stories wafting from the next boat, I was reminded that it is only with and through our friends that our stories exist at all, and that we live these stories many times over; once in the living, and then again, in the telling. Our stories could not have happened, and cannot be told, just for ourselves. We, and our stories, are not for ourselves, but for our own. I told my neighbor he wasn’t disturbing me at all. I didn’t tell him that I was imagining, hoping, I could be like them one day, sitting on the deck of my boat, laughing about all that had happened. That their stories and laughter were drawing my own friends close to me, though they were scattered to the four winds, back East, up North, down South, and even further out West, on the tiniest of islands and the edge of the Great Salt Lake, on the other side of the 49th parallel, the Mexican border or the Equator, off the grid, up in the hills, or in the desert, across continents and oceans, in the second trimester of pregnancy and the first year of grad school and the last year of residency, that they were paying off debts and raising small children and caring for sick parents and planning their weddings, writing their books and climbing their walls and growing their crops and doing their taxes. Our own stories were stuck in the muck of time, until we could tell them again. No one came out to the Sunshine Girl for a few weeks after that, and then Bill was there one night, drinking a glass of wine on the deck. Hadn’t seen him in a while, I said, or, come to think of it, hadn’t seen Matt, either. And as I said those words, I knew. “Matt passed away last week,” said Bill. “He had congestive heart failure. He died in his sleep.